greatwhitegamer replied to dani.drzr's topic in Fan Creations! Art, Fiction, Music, Etc. I watched the video you mentioned @Alyosha from NintendoGalaxy, It's just a concept trailer. It's just the Wintermute teaser trailer reused in a video that says its the Switch port trailer. @admin, here: https://youtu.be/ua9Y4AK6T7U This video is not my content. We all are some some point. Don't let it make it feel like you shouldn't participate here. All are welcome! Cheers! Same here. Also, welcome to the forums @fishedin! Cheers! greatwhitegamer replied to ArrayKnight's topic in Fan Creations! Art, Fiction, Music, Etc. I know it was yesterday but, happy Valentines Day everyone! Cheers! When I play interloper (rarely) I don't usually bother with the mail boxes, feels like a waste of time IMO. I'd rather try to get to shelter faster and save some condition from freezing. That being said, I once found a rifle round in a mailbox in a custom run. Cheers! I doubt that. Even though Hinterland is such a small team, I think we can expect episode three before then. I agree. I was thinking more along the lines of.. well no type of armor. I just like the idea of clothing pieces offering the protection, that is already in the game. No special armors you can craft, just regular protection buff you get from clothes. @Erlend Sooner than later. 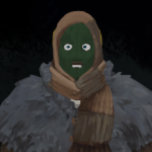 Hinterland hasn't announced a official release date yet. I'm guessing sometime this spring or early summer. It doesn't seem like a bad idea, but I don't feel like it fits this style of game. The Long Dark is more of the type of game where you have to use items from nature (pelts, guts, saplings) to craft essential items. Metal plate armor dosn't really match that. Also, the idea of a metal armor also makes it sound like were trying to protect ourselves from bullets, which we aren't. I could see this easily in other video games, but not The Long Dark. I like the idea of trying to better our protection against hostile wild life, but there are better ways than this. Didn't mean to sound aggressive, just expressing my opinion. Cheers! greatwhitegamer replied to k0s0ff's topic in Fan Creations! Art, Fiction, Music, Etc. The feeling of surviving a long trek and sitting in the Camp Office and cooking tomato soup. If you happen to stumble across a antler scratching on a tree when exploring the vast frozen wilderness of The Long Dark, tread carefully. A moose may have made residence nearby. I call this one "The last sunrise"